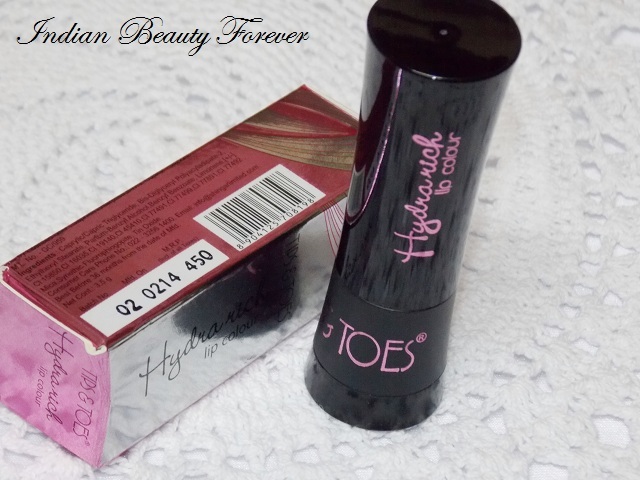 Being a lipstick lover and that too the brighter colors, has made me review yet another lipstick that I got from Tips and Toes recently, well not really. It’s been quite a while now. As a brand I have not used a lot of tips and toes products but whatever I have used, I guess one was a dual blush and an eye shadow palette. I can say that they didn’t fail to impress me right from the packaging to the actual product performance. 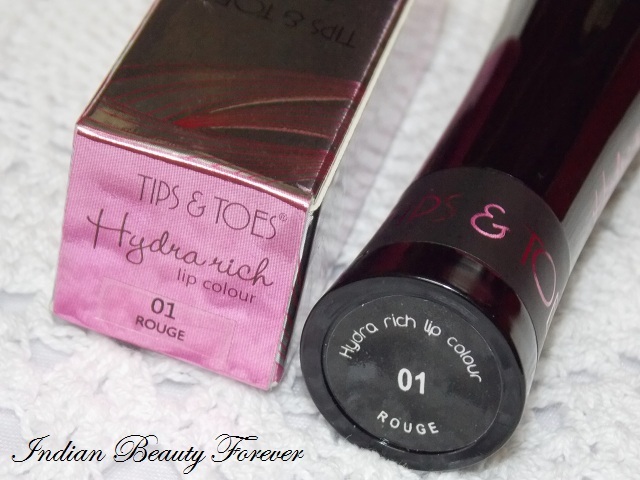 I will review Tips and Toes Hydra Rich Lip Color in the shade no 1 which is named as Rouge. 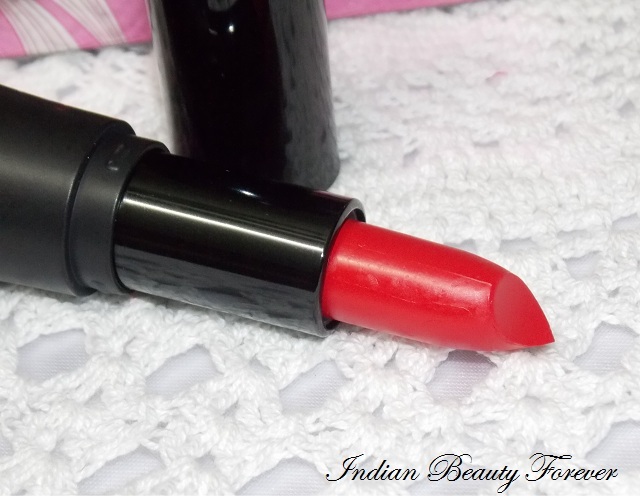 Price: Tips and Toes Hydra Rich Lipsticks are priced at 450 rupees and can be used for 36 months, provided, if you don’t lose it in your overflowing vanity and found it a day as a hidden treasure which happens a lot!! trust me. As far as the availability goes, I have seen their products at medplusbeauty.com earlier but they are not there anymore. My views on the products: This hydra Rich Lipstick comes in a thick black packaging that is slightly larger than the regular lipsticks size. The packaging isn’t too exciting or too bad to comment on, therefore, I can say, could have been better! 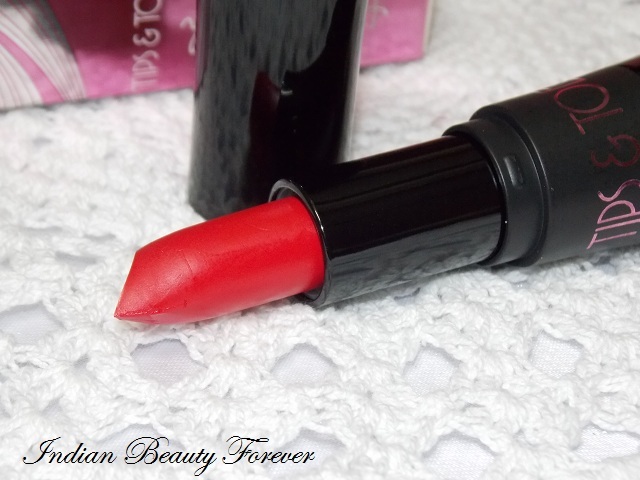 The lipstick has a very strong fruity smell which reminds me of some candy or jelly. For me it wasn’t a problem though that can vary from person to person! It has a creamy glossy texture that applies really nicely and smoothly and with this I don’t really need a lip balm prior to this though “scrubbed lips” is a criterion. As flaky lips can ruin the overall finish of any lip product! When I apply this, it goes effortlessly and kind of melts on the lips due to the heat. 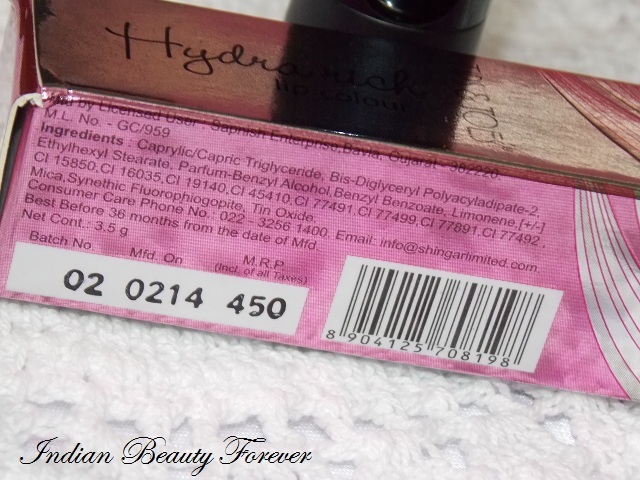 Its rich creamy texture gives it a finish more glossy and even with no patches at all. Rouge is a vibrant red with pink hues which becomes more prominent in daylight! 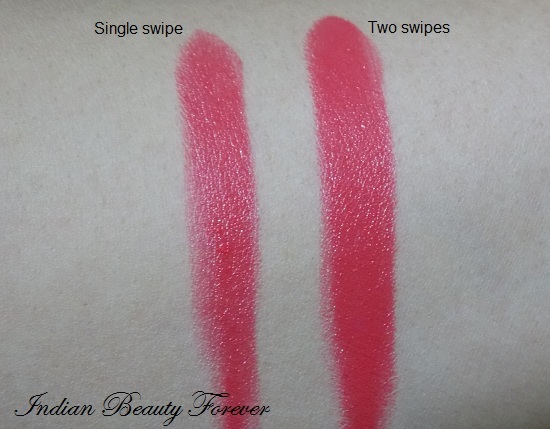 It’s a once stroke true opaque color type of lipstick that you may wear as a lip stain or in its full intensity! 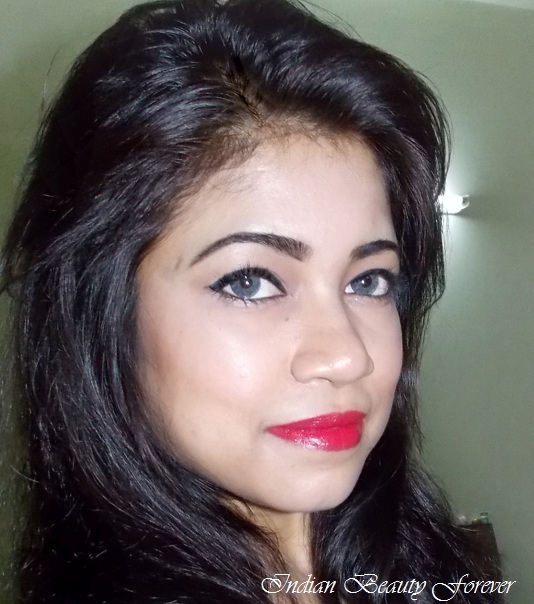 I am wearing it quite a lot lately along with the Revlon Colorburst matte balm in striking. It stays on me for 3-4 hours and once it erodes off, it leaves a subtle rosy red stain that most of the red lipsticks do. Now, as it’s very creamy, glossy and buttery, there comes a down side which is that, all these features makes it highly transferable and not to forget with bright color you have to be extra careful. They are prone to get on to your teeth or face even with the slightest touch. The same characteristics are to be blamed for its bleeding, so a lip liner would do. But I love its buttery smooth texture and intense pigmentation is what that makes me like it! 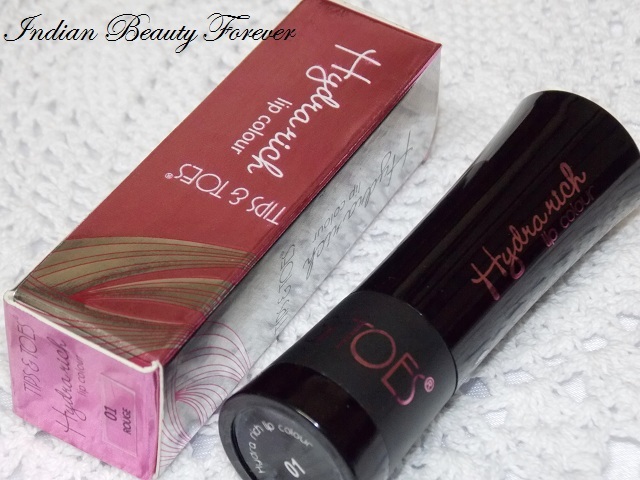 Take: Tips and Toes Hydra Rich Lip Color in Rouge is a pink based red which glides smoothly and evenly on the lips. 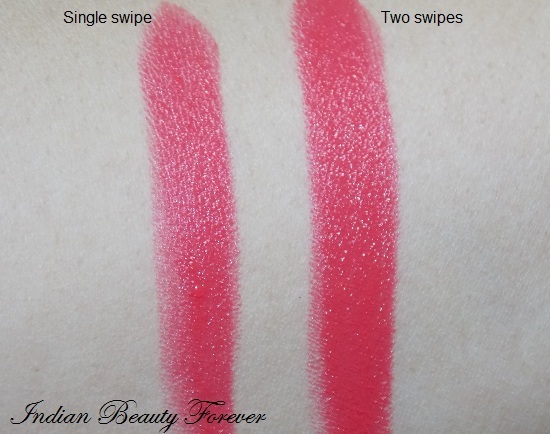 It comes as a glossy buttery finish on the lips and stays for 3-4 hours on me though it bleeds and also being a creamy bright color, it gets highly transferable. Lip liner would solve the problem. It can be sported as a stain or in its full glory. Availability is a concern and price is decent though it totally depends how much you want to spent and on which brand though as a product right from the color to the staying power it has impressed me.